by Chris Woodford. Last updated: June 13, 2018. When you're feeling dirty, you jump in the shower. When your pots and pans are dirty, they take a shower too—in a magic machine called a dishwasher. Scrubbing old food off dirty dishes is a tedious chore many people love to hate. Thanks to an ingenious American called Josephine Cochran (1839–1913), who invented the first automatic dishwasher in 1886, jobs like this can be a thing of the past. In Cochran's machine, you simply loaded your dirty crockery into baskets and the machine showered it clean with jets of hot and soapy water. Dishwashers have changed very little in the century since then—but how exactly do they work? Have you ever stopped to think what goes on inside the machine after you close the door? Let's take a closer look! Photo: Inside a dishwasher. When the door closes, pieces of rubber around the frame ensure a tight seal so no water can escape. Note the soap dispenser on the top of the open door. When you wash your dishes by hand, the water and soap stays still in the bowl or sink and you move the dishes around as you scrub them with a cloth or a brush. In a dishwasher, the opposite happens: the dishes and cutlery stay still in plastic baskets while pressurized jets of hot water shoot all around them. That means a dishwasher has to be sealed shut all the time it's operating or the water would fire off in all directions—all over your kitchen floor! A dishwasher starts its cycle by taking in cold water from a hose connected to the machine. Once a certain amount of water's sitting inside the bottom of the machine, a heating element starts to warm it up. The element is just a thick metal bar that gets hot when an electric current passes through it, and it gradually heats the water during the first part of the wash cycle. An electric pump takes the warming water and forces it up pipes in the side of the machine, which are connected to two spinning paddles. There's one paddle, made of metal, underneath the bottom rack of dishes and another one, made of plastic, under the top rack. 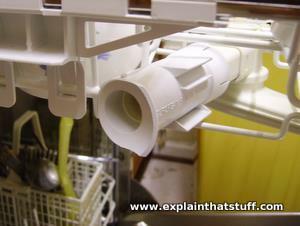 Photos: This is the plastic paddle underneath the top rack of the dishwasher. In the first photo, which is taken from the side, you can see where water enters the paddle through a large pipe. The water squirts up from small holes in the top of the paddle, which you can see in the second photo (looking down on the paddle from directly above). When water enters the paddles, it makes them spin around much like garden sprinklers. As the paddles rotate, the water emerges from small holes in their upper surface. The paddles make lots of hot spinning jets of water that fire upward onto your dirty plates. (That's why it's best to arrange your crockery so the dirty surfaces are facing downward.) The bottom rack and the bottom paddle are nearer to the heating element so the water is much hotter in the lower part of the machine. (That's why you'll see some crockery items marked "Top rack dishwasher safe"—which means it's alright to put them in the upper, cooler part of the machine.) After the water hits your dishes and plates, it falls back to the bottom of the machine, where it's heated up once more by the element and pumped round again for another cycle. Water pumps around the machine for half an hour or so until all the dishes and plates are clean. A sieve at the bottom of the machine catches any large bits of debris (to stop the machine jamming up), while smaller bits (and food remains) simply flush down the drain. Photo: This is what the bottom of the machine looks like when you remove the lower rack. The curved dark gray loop on the left is the heating element. You can see the metal paddle in the center. The holes in its upper surface make very hot jets of water that fire up into the lower rack. The drain holes are just beneath the paddle on the upper right. Just beneath it is a compartment where you pour salt to make the machine wash properly (the white oval shape). 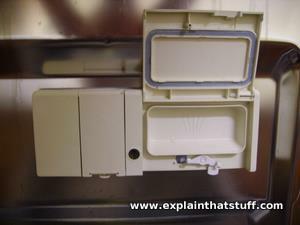 Photo: The detergent dispenser in the door of the dishwasher, shown here in its open position. The spring catch at the bottom flips the door open when the machine starts. The soap tablet drops down into the floor of the machine and dissolves in the hot water. What gets the dishes dry at the end of the cycle? The water that washes them is so hot that it simply evaporates away in the heat. 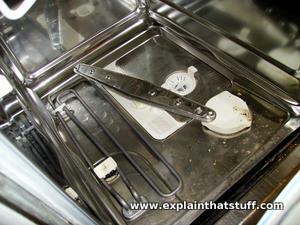 Providing you don't overload your machine, the dishes should dry naturally with no need for you to wipe them afterward. 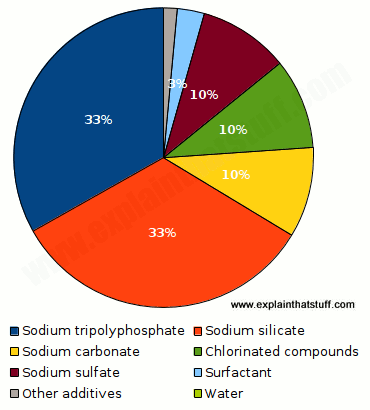 Chart: The ingredients in a typical dishwasher detergent liquid. Sodium tripolyphosphate (STPP) is an alkaline "builder" (water softener). Sodium silicate helps to prevent rust. Sodium carbonate breaks down acids and fats. Chlorine compounds disinfect and help to break down protein-based food remains. Sodium sulfate is an anionic surfactant; nonionic surfactants are also present. Other additives include enzymes and fragrances. Source: Based on the approximate figures quoted in Table 9.1, Liquid Detergents. Edited by Kuo-Yann Lai. CRC Press, 2005, p.321. The other essential ingredient in a dishwasher is liquid or solid (tablet-form) detergent to help break down the grease and grime on your crockery. You load up the detergent into a dispenser in the door and, sometime during the wash cycle, usually a while after the machine first switches on, the dispenser flips open, dropping or dripping the detergent into the hot water bath in the bottom of the machine. Dishwasher detergents work much the same as clothes detergents, which you can read all about in our article on detergents. Briefly, they consist of a mixture of ingredients for tackling the various different kinds of food deposits likely to be left on your cutlery and crockery, plus things like water softeners, anti-corrosion chemicals to stop the machine rusting, and attractive fragrances. Apart from detergent, dishwashers also need occasional supplies of "salt" to reduce limescale and keep their built-in water filters working properly. Cold water is piped into the machine from your home water supply. The heating element at the bottom of the machine, powered by electricity, warms the water to a temperature of 30–60°C (86–140°F). That's far hotter than the water most people would use to wash by hand, which is one reason why dishwashers are more hygienic (remove more bacteria) than ordinary hand-washing. The other reason is that the dishes are washed for much longer. An electric pump at the bottom of the machine pumps the water up through the side walls. The water squirts up through holes in the bottom, metal paddle, making it spin around. The bottom paddle is made of metal because it needs to withstand hotter temperatures at the base of the machine. Slightly cooler water squirts up through holes in the upper, plastic paddle, making it spin around too. Remember that the top of the machine is slightly cooler than the bottom so a plastic paddle is acceptable here. 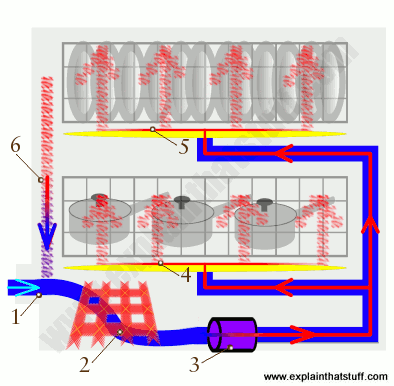 In this example, I'm covering dishwashers that connect to the cold water supply ("cold feed") and heat the water for washing. Some dishwashers are connected to the hot supply instead (they work faster, because they don't have to heat the water so much), while others are connected to both the hot and cold supplies. If you're tired of science books and websites that make it seem like all inventors are men, you'll be pleased to hear that dishwashers were invented by a woman: Josephine Cochran of Shelbyville, Illinois in the United States of America. She applied for her patent (with Jacob Kritch) on August 19, 1887 and it was granted on October 30, 1888. How did Josephine do her dishes? Like this! Here are her original patent drawings, which I've colored for clarity, and simplified a little. On the left, we can see the machine from the front; the drawing on the right shows a side view. 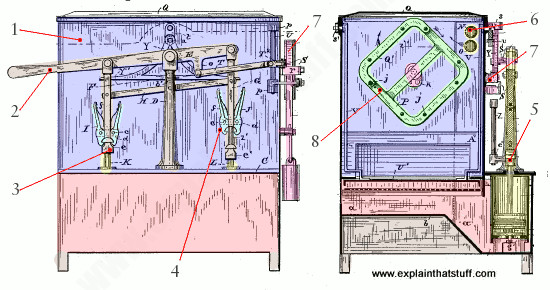 Artwork: Josephine Cochran's groundbreaking dishwasher from 1888. Artwork courtesy of US Patent and Trademark Office. You can find the full patent description (with more drawings and details of the ratchet mechanism) at US Patent #391,782: Dish-washing machine via Google Patents. Also of interest is Cochran's later and more elaborate US Patent #512,683: Dish-cleaner. At the top of the machine, we have the washing compartment (blue) where you load your dishes into a rack, which Cochran called the grate. The lower part of the machine (red) is the water tank. Sorry, there's no electricity here! This machine is entirely mechanical and hand-operated: you work it by pumping up and down on the handle at the front. The handle has two vertical rods running down from it operating two independent pumps. One of the pumps is for washing the dishes and blasts hot soapy water around the washing compartment; the other pump is for rinsing the soap and dirt away with clean water. At any time, the pumping handle is connected to one or both of the pumps, but not both. The place I've marked is where you connect and disconnect the pumps. You attach (or disconnect) the two pumps to the pumping handle, in turn, using the grip pliers (turquoise), which clamp the handle to the pumping rods underneath. Now looking at the side-view diagram (on the right), we can see a cross-section of one of the pumps. Each time you heave the handle up and down, it draws in water (either hot and soapy or clean rinse water, depending which pump you're using) from the bottom and then pumps it up to the top of the machine. The water sprays over the dirty dishes from two perforated pipes (yellow) at the top. The pumping handle is also connected to a ratchet and wheel mechanism on the side of the machine that rotates the grate inside. The grate (green), filled with crockery and cutlery, slowly rotates all the time you're washing, so that (as Josephine put it) "each renewed spray will dash against the contents of the gate in every position they may assume" (in other words, ensuring everything gets washed and cleaned from all directions). I think it's fascinating to study this design and see how little has changed in modern dishwashers. We still have a washing compartment at the top and a water compartment at the bottom but, instead of a rotating grate, we now have rotating water paddles. Cochran's original design nailed all the details: it even contains water filters "to prevent any of the substances or particles washed from the dishes from entering the pumps and clogging up the pipes." Modern dishwashers are powered by electricity, but are they more effective and efficient? Probably not. This machine looks like it might be hard work but, according to Cochran, the dishes come clean "very readily owing to the force with which the spray is dashed against them, only a very few strokes of the pump being required for that purpose." How many people do you know who own a dishwasher and never use it? According to a 2017 report by the US Energy Information Administration, "dishwashers are among the least-used appliances in American homes." Fewer of us own dishwashers than microwaves, stoves, clothes washers and dryers, and about 20 percent of us don't use them even when we do. More affluent people use their dishwashers more often, as you might expect. Charts: Left: Do you own a dishwasher? Just over two thirds of Americans do (green slice). Right: How often do you use it? Most use their machine 2–3 times a week, but 20 percent don't use it at all. Data from US Energy Information Administration (EIA) Residential Energy Consumption Survey (RECS), 2015. Dishwasher Manual by Graham Dixon. Haynes, 2009. A generic repair and maintenance manual aimed at skilled home-DIY enthusiasts. Patently Female: From AZT to TV Dinners, Stories of Women Inventors and Their Breakthrough Ideas by Ethlie Ann Vare and Greg Ptacek. Wiley, 2002. A look at the contributions female inventors have made to modern life through such things as the dishwasher. Why That Sippy Cup Won’t Dry in the Dishwasher by C. Claiborne Ray. The New York Times, 2 March 2018. A fascinating scientific insight into why plastics don't dry so well in your washer. Dishwashers are among the least-used appliances in American homes: Today in Energy, EIA, 19 June 2017. Lots of people have dishwashers that they never use. 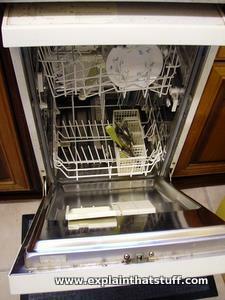 Eco appliances: energy-saving hints for dishwashers by Lizzie Kenyon. The Guardian, 25 April 2014. Don't pre-rinse, don't half load, and use a medium setting if you want to save money. New Dishwasher Super-Arm Took 8 Years to Design by Charlie Sorrel. Wired, 1 December 2010. How an AEG engineer reinvented the spray arm. The Dish on Dishwashers by Arianne Cohen. The New York Times, 20 May 2009. 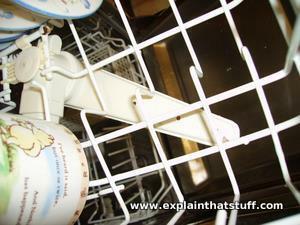 Some of the common problems that stop dishwashers getting your crockery clean. How green is a dishwasher? : BBC News, 2 October 2006. Do you save more energy washing by hand or using a dishwasher? Dishwasher maintenance by Evan Powell, Popular Science, March 1980. This old but excellent guide to dishwasher troubleshooting runs through common problems with the float, pump, door seal, detergent release mechanism, and timer. "Chapter 3: Dishwashing with Detergents" by Joan Gambogi, Sharon Kennedy, and Edna Ambundo. In Handbook of Detergents, Part E: Applications. Edited by Uri Zoller. CRC Press, 2008. A superb review of dishwasher detergents, what chemicals they contain, and how they work.